Having been a graphic designer for more years than I can count — and the owner of my own design studio for more than 15 of them — I can tell you one thing: When you find your niche; your ideal clients; your ideal projects…work ends up fulfilling you in more ways than you previously thought possible. For me, that niche is travel and tourism. Those ideal clients are destination marketers and the business owners that make those destinations unique. The ideal projects center around the branding and marketing collateral that keep those destinations top of mind amongst visitors and consumers. I’m excited to be sharing a few of those projects with you today in my first client/project roundup on the blog. This roundup edition is focused on just a few of the destination travel guides I worked with clients on throughout the first quarter of 2017. 1. These are each printed guides, with circulations in the tens of thousands. While digital and social are undoubtedly important in today’s world, print is far from dead in the travel industry. In fact, when done well, printed travel guides are more appreciated than ever before. Throughout my most recent visitor guide projects, we’ve aimed to blend the online and physical worlds by including user-generated content (i.e. submitted stories; case studies; Instagram posts), social proof (first-hand reviews, candid photographs, testimonials, Tweets), and more. 2. Developing and designing a destination’s travel guide is a long-term process that requires a deep dive into the people, history, culture, and stories that make each and every destination unique. It’s actually what I love most about doing visitor guides: Becoming deeply integrated into cities and counties by venturing out on photo shoots, chatting with locals and tourists alike, and often visiting places I likely wouldn’t get a chance to otherwise experience. 3. At approximately 50 pages each, the pieces I’m sharing here are content rich, from both a visual and written standpoint. Each one is worthy of a coffee table, and nothing makes me happier than hearing that people both collect and cherish these guides. 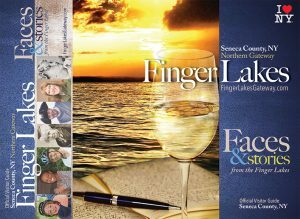 Appropriately titled Faces & Stories, the Seneca County visitors guide is based heavily on the locals who make it home, and welcome visitors on the regular. What I enjoyed most about this project was the collaboration it took to achieve it. Seneca County’s staff conducted video interviews, while a colleague of mine took photos, and I provided art direction. Each person interviewed contributes to the local economy and tourist industry in some way — from wine and craft beverages to agriculture to accommodations and everything in between. Being on site of each of these interviews gave me an intimate look at the people and the passion they have for what they do, bringing me closer to the community so I could create a piece that’s truly reflective of who they are. What makes this guide even more unique is that we ran it horizontal, instead of portrait — a characteristic that firmly sets it apart from other guides on the shelf. Fun fact: This year’s work on Seneca County’s Faces & Stories was an update of the original piece we created last year, which took home the Excellence in Tourism Marketing Award at the New York State Tourism Industry Association annual awards. Taking a historical approach, the 2017 Livingston County visitors guide is a time-traveling adventure. What I enjoyed most about this project was the deep dive into the history of the region and the memories that came with it. Pictures and stories compare then to now, and respected traditions are shared while also celebrating just how far businesses and attractions have come in the County. Fun fact: The iconic train bridge over Letchworth Park was originally a wooden bridge that was destroyed by fire in 1875. It was rebuilt from iron and steel, and today, thousands of travelers visit it in all seasons. I have two challenges for you: First, next time you’re in an airport or rest stop, pick up a guide or two and dive into the stories. Second, don’t hesitate to share yours — it’s the stories of locals and visitors that create a destination’s true brand. As an avid traveler myself, I love that through my artwork and design, I’m able to help promote amazing places for people all over the world to explore. Getting to partner with destination marketers to visually tell the story of their travel brands and connecting visitors to their ideal destinations lights me up and gives my work even more purpose. P.S. When your destination is a brand in and of itself, you can make it peak season all year round.